Plantains are notorious for bringing a taste of the islands to any meal. These Sticky Sweet Fried Plantains are an extra sweetened up version that are just as great as a side dish or as dessert! My fiancé first introduced me to the amazingness that is fried sweet plantains. Since I had never had them growing up, I didn’t ever really give much thought to trying them. Then, one day he came home with Jamaican take out food, and after my first bite, I was hooked. Now I make them all the time alongside of Cuban Pork and Creamy Coconut Rice! I always thought plantains would taste like bananas, but they really are quite unique. When they are green and not ripe at all, they don’t have nearly as much flavor and are very starchy. While I even like them this way, my favorite plantains are more ripe. As they ripen, they turn from green to yellow to dark yellow with blacks spots to black and they get sweeter and sweeter as they continue ripening. You can cook plantains, in different ways, at any stage of ripeness. For this recipe, you need to use plantains that are just ripened to very ripe. Overly ripened, black plantains won’t work as well because they will be too soft and mushy. The plantains I used for this recipe were at the earliest stage of ripening. The skin was a darker yellow and they were were just starting to turn black at the ends with black some spots on the middle. They were still somewhat firm, but soft under pressure. After quite a few recipe testing sessions, I finally have this recipe perfected to give you the most perfect friend plantains ever! This recipe brings a sweet taste of the islands to any meal you serve them with – even dessert! Sweet Fried Plantains are a family friendly dish even kids will love. Using just ripened plantains keeps them from turning to mush as they cook, giving you perfect, delicious results every time! 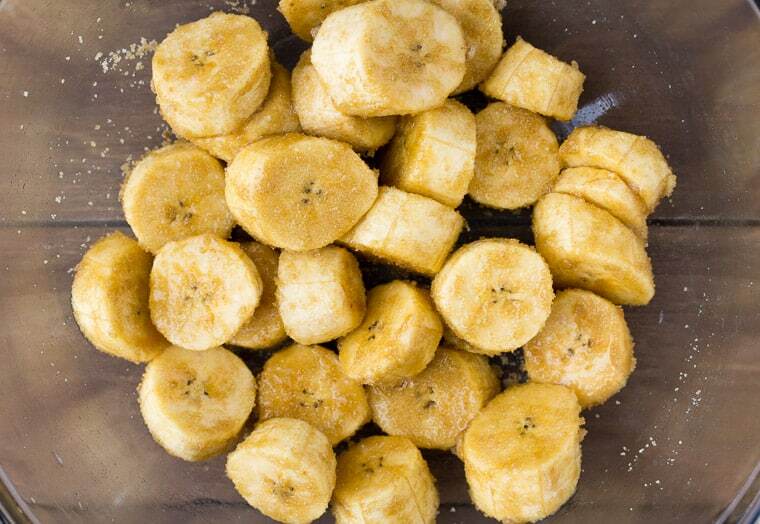 Slice your plantains into coins or at an angle into 1/2″ thick pieces. Whisk together the maple syrup and vanilla extract. Don’t cheat yourself here. I always recommend using real maple syrup and vanilla extract for the best results! Add the plantains and brown sugar to a large bowl and gently toss to thoroughly coat them. Melt the coconut oil in a large skillet over medium heat. Place the plantains into the hot oil and drizzle on the maple syrup and vanilla mixture. Cook until golden brown and crispy on the bottom, about 3-5 minutes, watching closely to prevent burning. Once browned, flip and cook an additional 2-4 minutes. The bottom side will usually cook faster as the sugar heats up and starts caramelizing, so be sure to watch them closely! Remove from the heat and pile onto a serving plate or into a bowl. 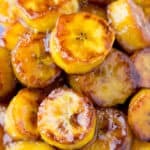 Do not place them on a paper towel, as this recipe results in sticky plantains and they will surely stick to the paper. Be sure to use plantains that are just ripe to very ripe. Avoid using overly ripe, black plantains for this recipe. Tossing the plantains in the brown sugar, rather than sprinkling it on, will give you more evenly caramelization. Use real maple syrup and vanilla extract for the best results. Whisking together the maple syrup and vanilla extract helps ensure an even distribution of flavor. Keep the heat set to medium. The sugar will heat up as it caramelized, so if you need to work in batches, be prepared for the second batch to brown up much quicker! Do not place the cooked plantains on a paper towel-lined plate – they will surely stick! 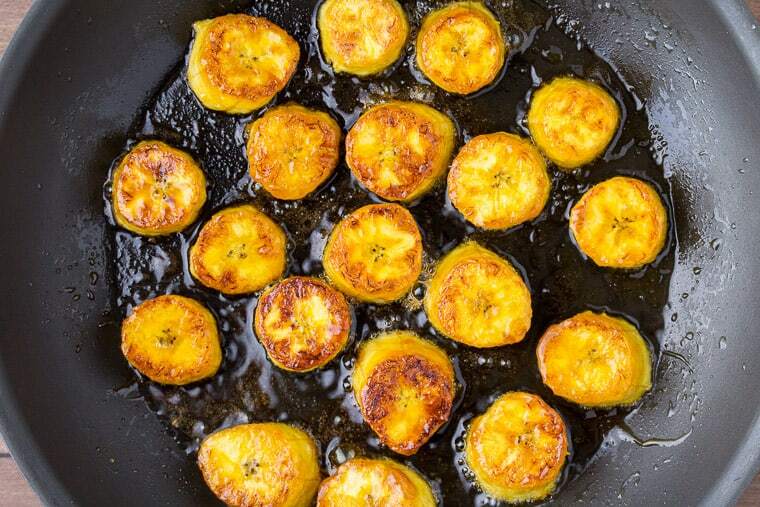 How ripe should plantains be for frying? Plantains can be anywhere from unripened to very ripe for frying depending on how firm and how sweet you want them to be. 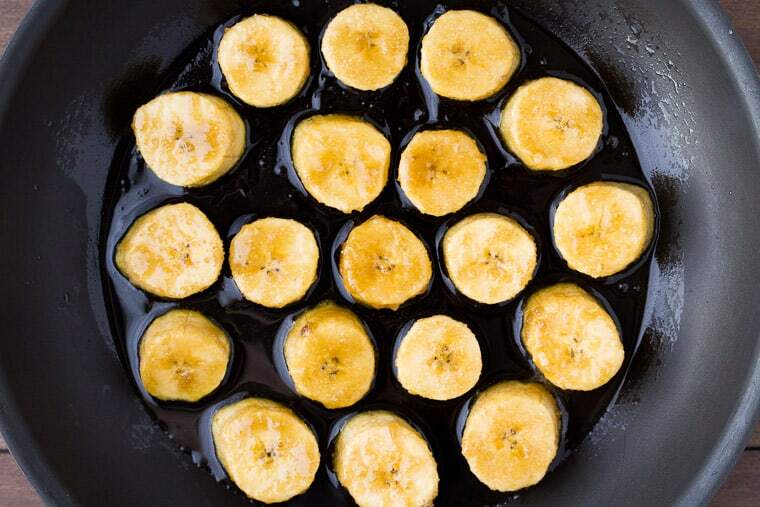 Avoid using overly ripened, black plantains. What do you serve fried plantains with? 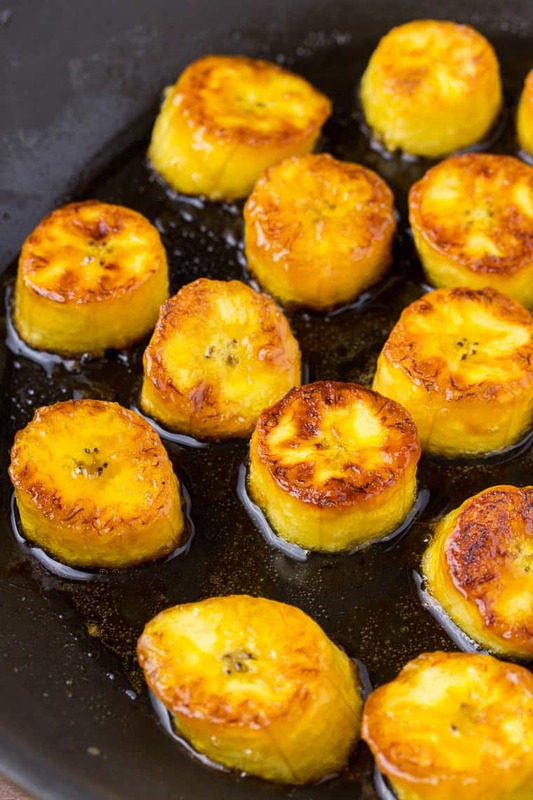 Try the Fried Sweet Plantains alongside of a Cuban pork or chicken dish. They are also great over ice cream or eaten alone as a snack or dessert. Do plantains taste like bananas? No, not at all. 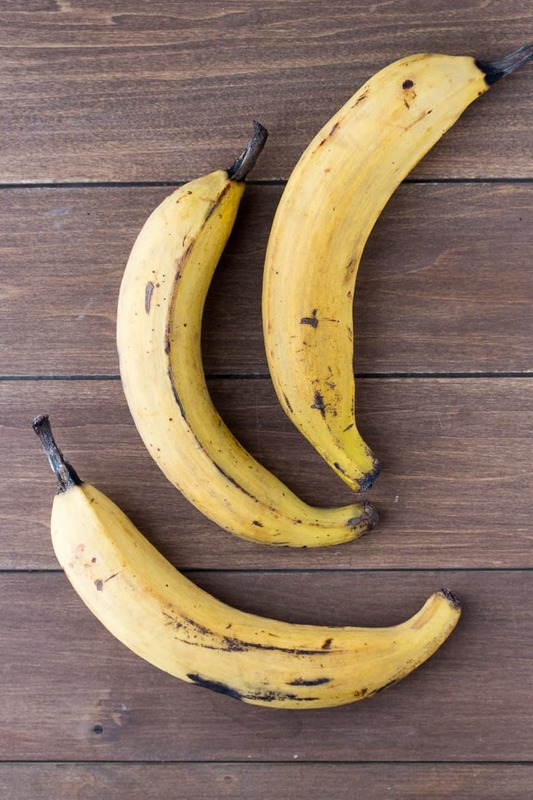 While they resemble a banana and sweetened as they ripen in the same way as a banana, they have a unique flavor all their own. 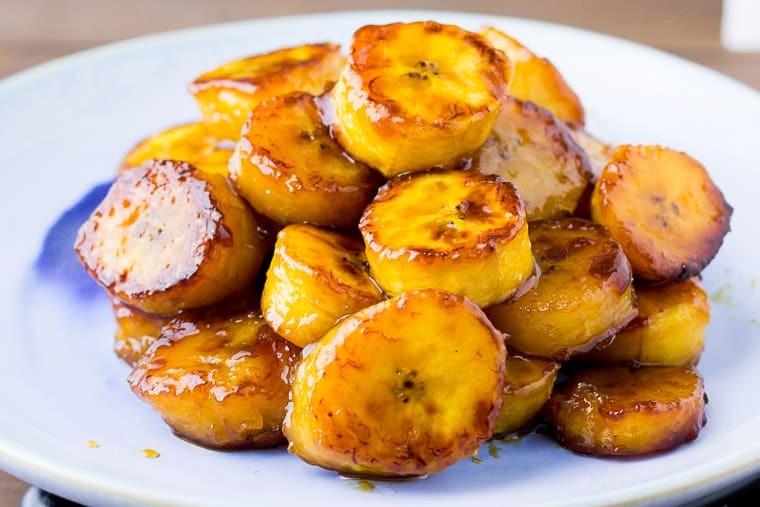 Love this Sticky Sweet Fried Plantains recipe? Follow us on Pinterest, Instagram, and Facebook for more! Plantains are notorious for bringing a taste of the islands to any meal. 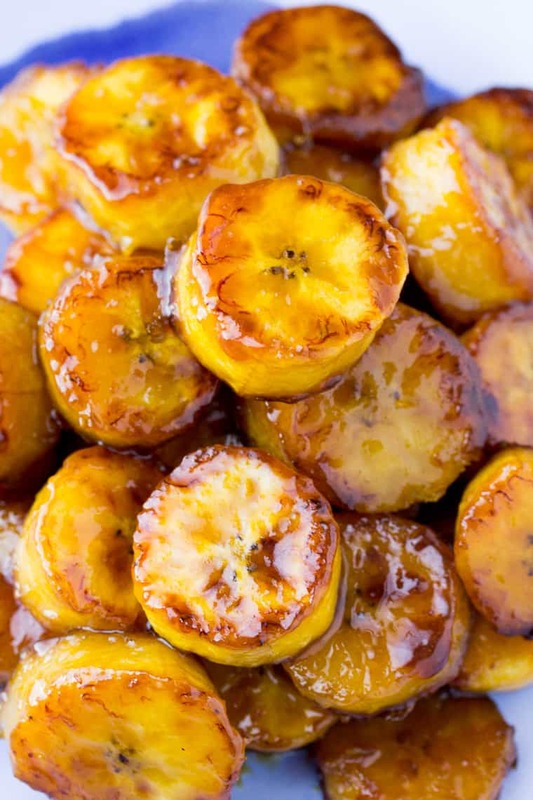 These Sticky Sweet Fried Plantains are great as a side dish or dessert! Peel and cut the plantains into 1/2" coins or slices. Whisk together the maple syrup and vanilla extract. Add the plantains and brown sugar to a large bowl and gently toss to coat. In a large skillet, melt the coconut oil over medium heat. Once hot, add the plantains and evenly pour on the maple syrup mixture. Cook until browned and crisp on the bottoms, about 3-5 minutes. Be sure to watch them closely to prevent burning! Once browned, flip the plantains and cook an additional 2-4 minutes, again watching closely to prevent burning. Transfer to a bowl or plate and serve warm. Do not place the cooked plantains on a paper towel-lined plate - they will surely stick! This recipe was originally published on July 12, 2018. The text was updated in April 2019 to include more thorough instructions, tips, and FAQ’s.